OK, I’m a history buff – no surprises there. On my iGoogle page I have a Today in History feed. Today, August 15, is the anniversary of two great moments in 60s music history. In 1965, The Beatles performed at Shea Stadium to a large crowd of over 55,000 screaming fans. Read the Wikipedia link (above) with information about the crowd and the number of security personnel used to keep them in check. Also, it points out that The Beatles only played for about 30 minutes. Four years later, the Woodstock Music and Arts Festival opened in Bethel, NY. Close to a half million people clogged the NY Thruway and other roads to get there. It was a legendary three days of music. I remember the first time I saw the documentary in the theater in 1970. I wonder how many of the screaming fans in the stands in Shea Stadium were at Woodstock? My how they had mellowed. I got to thinking about how much had changed in those short four years. The Beatles in their matching outfits compared to the jeans and grunge look of most of the performers at Woodstock. The 30 minute set of three-minute songs compared to the long sets and incredible solos by Jimi, Alvin Lee, Janis, The Who, Santana and Sly Stone. We’d gone from Can’t Buy Me Love to the FISH Cheer (or another F-word) and Jimi’s version of the Star Spangled Banner. The nation had changed also. Gone were the days of Camelot, JFK and LBJ. Richard Nixon was president and the War in Vietnam was causing a rift between generations. 1968 had seen the deaths of MLK and Bobby Kennedy, riots in the inner cities, protests in Chicago at the Democratic convention, and Nixon’s narrow victory for the presidency. JFK’s dream of putting a man on the moon had been accomplished the month before Woodstock, but now what? Could the nation afford the space race, the wars in Vietnam and on Poverty? 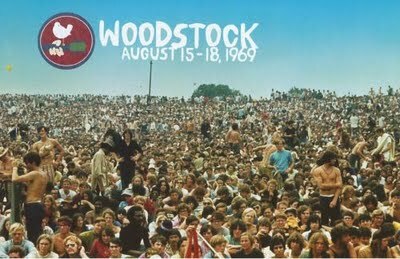 However, on that August day in 1969 the thousands at Woodstock were getting high on the music (and maybe some drugs) – and for those three days peace and love prevailed.